She was found as a stray so we will not place with young children. Susie loves people but is a no to small dogs & small furries, very reactive to small dogs while on lead. Her lead work does need some time spending on, but she does have the basics. We currently walk her on a dogmatic to lesson the lunging at other dogs. Since being in our kennels, she has improved but it's a work in progress. She has no idea how to meet dogs on lead and this comes across as aggressive. She travels well and is micrchipped, flead, wormed & vaccinated. Susie loves being groomed and once she knows you, is very responsive to commands. 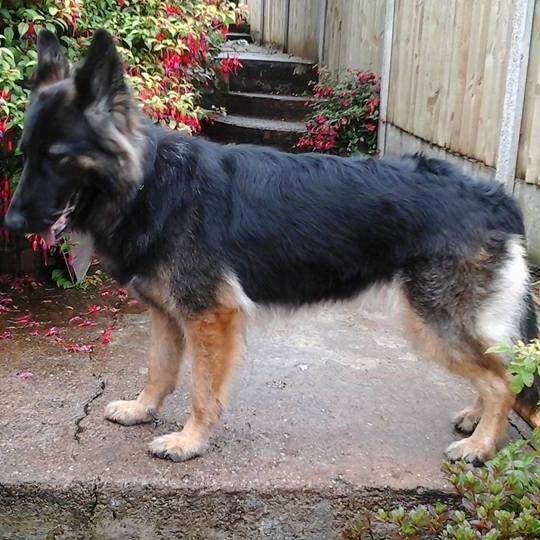 She has lived with 2 adult sheps in foster. Susie would benefit with further training and needs an owner that will devote the time to give her what she requires.